All-new artwork based on the TV series. 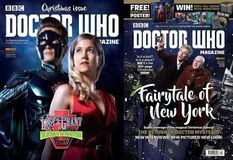 Fairytale of New York; The Return of Doctor Mysterio; includes a double-sided poster. Interviews with Mary Robinette Kowal and Blake Charlton; industry news; reviews; more. Amy is a self-replicating humanoid robot. For the past five years, she has been grown slowly as part of a mixed organic/synthetic family. She knows very little about her android mother's past, so when her mother is attacked by Amy's newly-arrived grandmother, Amy eats her. Now she carries her malfunctioning granny as a partition on her memory drive, and she's learning impossible things about her clade's history - like the fact that she alone can kill humans without failsafing. Thorvald Spear continues to hunt rogue AI and dangerous war criminal Penny Royal, following the trail of several enemy Prador. Penny Royal continues to pull all the strings, keeping the Polity at bay. It seeks a wartime manufacturing space station. But why? On a mission to a distant system, Lt. Commander Peter Cochrane and crew are drawn to a mysterious abandoned space station, where they discover the remnants of a terrible ancient battle. However, something is waiting for them . . . and that's only the beginning of Peter's troubles. Ages 9 and up. On an abandoned moon base, the Twelfth Doctor discovers a flesh-eating horror. Can he stop it? You decide what the Doctor should do next. Britain, 1801: The rowankind, long a source of free labor, have shaken off their bonds. Some have returned to Iaru, others seek payment and fair treatment. The course of the industrial revolution may change forever. Though the Mysterium tries to control it, wild magic is on the rise. And Ross and Corwen, witch and shapechanger, soon find themselves in the midst of the conflict. Signed by David Brin. Essays and stories that examine the benefits and pitfalls of technological transparency. After some unfortunate mishaps between the dragons and the Fae, Librarian spy Irene is on probation, doing simple fetch-and-retrieve projects. But trouble has a tendency to find Irene and her apprentice Kai - her nemesis Alberich is back, and this time he aims to destroy the entire Library, and Irene with it. Collects some of his short fiction. Night Vale is a small town in the US Southwest where ghosts, angels, aliens, and government conspiracies are part of everyday life. When pawn shop owner Jackie Fierro's search for her former routine life and PTA treasurer Diane Crayton's attempt to reconnect with her shape-shifter son collide, they find themselves coming back to a single clue: 'King City'. King City holds the key to both of their mysteries, and their futures - if they can ever find it. A collaborative novel. Magic is real, and hungry, trapped in ancient texts and artifacts. Only a few who discover it survive to fight back. The members of a Vatican-backed anti-magic squad stand together between humanity and the magical apocalypse. Collects all the Newsflesh short fiction, including two novellas original to this volume. A prequel set roughly six years before Star Wars: The Force Awakens. Plus bonus short story 'Scorched' by Delilah S. Dawson. Dragonscale, a spore that marks its hosts with black and gold marks, and eventually causes them to burst into flames, is spreading. As communities collapse in terror, the Fireman strolls the ruins of New Hampshire. A madman infected with Dragonscale, he has learned to control the fire within himself, using it as a shield to protect the hunted - and as a weapon to avenge the wronged. In the 1940s and 1950s, when the Jet Propulsion Laboratory needed mathematicians, they recruited an elite group of women who transformed rocket design, helped bring about the first US satellites, and made space exploration possible. This is their story, based on extensive research and interviews with all the living members of the team. Coop specializes in stealing magic objects. When he steals and delivers a small box to a mysterious client, he suddenly finds himself in the company of the Department of Peculiar Science. They tell him the box isn't just a supernatural heirloom - it's a doomsday device. They think. And now everyone is out to get it. San Francisco, 1940: Tourists flock to the Magic City, a island created of artifice and illusion; to Chinatown's nightclubs that offer 'authentic' experiences straight from the pulps; and to the twilight world of forbidden love, where outcasts from conventional society can meet. Here six women find their lives tangled as they discover love and danger on the borders where magic, science, and art intersect. On a lone spaceship, the murdered crew are resurrected through cloning. They need to discover who their killer was - and the secret of their mission. Full color. Includes secrets from the latest series, fact files on the latest monsters, comic strips, stories, puzzles, and activities.